In my travels this week I came across a stunning wisteria vine. Wisteria, at its' best, is a fragrant bower of unsurpassed, unique, delight! To happen upon one in full bloom is memorable. I don't know many of us who look forward to a trip to the local grocery store. At this time of year, when this wisteria is in bloom, the monotony of the task of grocery shopping is overshadowed by the residual 'high' after walking beneath this particular arbor. While I was photographing this vine, several people stopped and looked at this one with wonder and curiosity One woman asked me if I knew what it was. I didn't think there were many people who have made it to middle age and still don't know what wisteria is but, apparently, I was wrong. The positive here is that this person actually took notice of it. Some just walked on by! There are two popular species of wisteria, the Japanese wisteria, Wisteria floribunda and the Chinese wisteria, Wisteria sinensis. The one in this picture is twining counter clockwise (I think) which is a trait of the Chinese wisteria. 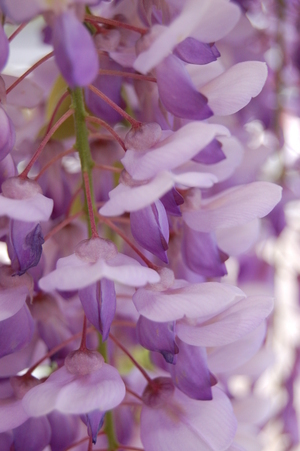 One of the most common horticultural questions asked is 'Why isn't my wisteria blooming?' There is no easy answer to this question. I know that this particular plant must thrive on neglect as it is in between the parking area and the driveway to this particular store. 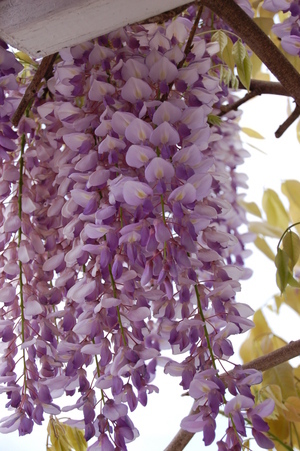 If you are going to purchase a wisteria it is advisable to pick one that is blooming and pick a named cultivar. I have heard complaints of ten year old vines which have never bloomed. Nitrogen fertilizers should be avoided but super phosphate can be used to try to induce blooms. Judicious pruning is advised on a regular basis cutting back vigorous growth to 3 or 4 buds. Wisteria is perfect only when it is in bloom. At its' worst, wisteria is a thug which can trample everything in its path. This is more of a problem in zones 7 and south. 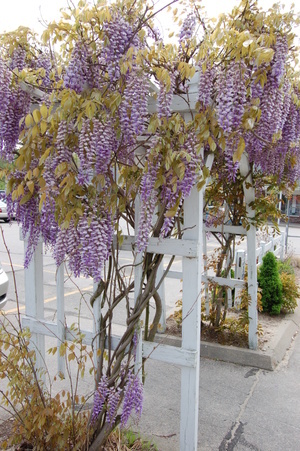 I don't currently own a wisteria but should I ever put up a sturdy arbor or pergola, I will definitely consider one as its' spring fragrance is as memorable as that of lily of the valley or lilac. I can't wait to pick up a few items at the grocery store tomorrow!